Why suppliers should consider becoming a MAPS member. 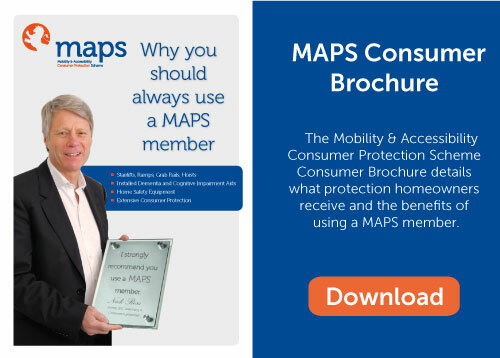 The Mobility & Accessibility Consumer Protection Scheme (MAPS) helps organisations promote a professional image and attract new consumers. As part of a consumer protection organisation, our members must demonstrate their commitment to treating customers fairly, at all times. MAPS accredits and audits its members, monitors all customer feedback and writes to every customer with a customer satisfaction survey to find out what customers really think of the service provided to them. This provides a quality platform in which the members can further build their reputation and business. MAPS also provides comprehensive point of sale marketing materials to assist members promote their membership. MAPS is designed to ensure that products are sold correctly, properly installed in a professional manner and members provide excellent after care services. MAPS also offers extensive consumer and supplier support in the event that something goes wrong, giving peace of mind to suppliers and consumers alike. It is a neutral intermediary and as such, can help both the consumer and the supplier should either party require help or assistance. Endorsed by consumer champion Nick Ross – former BBC Watchdog & Crimewatch presenter. Not every company in this sector can qualify for MAPS membership – to maintain high standards. Point of sale material featuring Nick Ross – includes brochures, leaflets & dropcards. Rights Act – saving legal fees. Local PR support – to announce your membership to prospective customers. Sales training & advice – to help your sales personnel convert more quotes into orders. Peace of mind for consumers – giving customers greater confidence to place orders with you. Online facility – to put consumers and members in touch with each other. Complaints handling and alternative dispute resolution (ADR) services – including Customer Service, Mediation, Independent Inspections (at our discretion) & an independent Ombudsman service. If you would like to know more about MAPS please call 0333 323 9688, or complete the membership enquiry form to the left.